This Handbook replaces that of the same title in the same series. In the description of uniform 'Scout Colours' refers to the traditional colours of Khaki, Navy Blue, Green or Grey. Shirt or Jersey of Scout colour. Shorts or Trousers (Scouters/Officers with medical conditions only); of Scout colour. Long Socks of Scout colours with two Scout Green (Emerald) rings on the downturns with Maroon Garter Tabs. Headgear - Scout Hat (Khaki) or Beret (Maroon). Skirt and Shirt or Jersey of Scout colour. Skirt or Culottes of Scout colour. Lady's Stockings or Tights (Scouters/Officers) of appropriate shade. Long Socks (BGS) of Scout colours with two Scout Green (Emerald) rings on the downturns with Maroon Garter Tabs. Headgear (Officers); Dark Blue Cap with black band and white cover. Headgear (Scouts); Bluejacket's cap with a white cover and a ribbon inscribed 'Marine Scouts' or similar. Shirt or Jersey; Dark blue, Jerseys with the words 'Marine Scout' or similar in white letters across the chest; or shirts with an anchor badge on the right breast. White Shirt without badges (but with neckerchief) may be worn other than parade 1st May - 30th September. Shorts or Trousers (Officers); Dark Blue. Shorts (BBS), Skirts (BGS) on shore, Trousers, when afloat in bad or cold weather; Dark Blue. Shirt or Jersey; Grey or Pale Blue. An Aviation Scout Badge may be worn on the left breast above any service stars or medal ribbons. In place of this Aviation Scout Wings Badge is worn by those qualified as a pilot or equivalent. Scouters/Officers when they are with their Group shall wear the neckerchief of the Scout Group. When Scouter/Officers are not with their Group or Company they may wear either their Scout Group neckerchief or the 'Order of World Scout' neckerchief for those holding the 'Wood Badge' issued by the 'Order of World Scouts'. Shoes must be of appropriate colour and must be standard within a section selected from black or brown. Thumsticks, as an alternative to the Scout staff. Scout Staff, carried on suitable occasions. Lanyard, to carry a whistle or knife. Handaxe, carried on the belt, but only on appropriate occasions. Rescue Cord, a 180cm long neatly coiled cord carried on the belt. First Aid Kit, a small First Aid kit carried on the belt on appropriate occasions. Outdoor Wear, the members of any Section of a Group should be encouraged as far as possible to wear raincoats of the same style and colour; but, if necessary, and overcoat of a plain colour may be worn. Bright colours or loud patterns must not be allowed. Sheath Knives, must not be worn in public places, other than at Camp and as part of the Uniform. Folding Pocket Knives may be carried at any time, provided the blade does not exceed 8cm (3 inches). Pocket Knives with longer blades must not be carried in public places. In Uniform a cloth badge with the letters BBS or BGS superimposed in red on a white arrow with a black ground, worn mid-point between elbow and shoulder of the right sleeve; A cloth badge with a white 'Peace Lily' Fleur-de-lys on a blue background or a 'Red Fluer-de-lys' at the discretion of the Scout Group but must be consistent throughout worn on the left breast of the shirt or blouse. A Patrol Seconder wears in addition, on the left breast of the shirt or blouse, one stripe of Maroon braid, 15mm wide and 8cm long, on the right hand side of the Fleur-de-lys badge. A Patrol Leader wears two stripes of Maroon braid as above either side of the Fleur-de-lys badge. A Troop Leader wears three stripes of Maroon braid, with the third stripe behind the Fleur-de-lys badge. Understand the Scout Pledge/Promise and Scout Law in accordance with his or her age and development. Pass or re-pass the Tenderfoot and Second Class tests. (a) Homebase. There must be a homebase, to which the Scouts can make telephone contact during the journey, and a journey Supervisor appointed, who must be in the vicinity of the journey, to ensure the safety of the Group. (b) Numbers. A minimum of 4 Scouts and a maximum of 7 Scouts, must undertake the journey. It is not necessary for all the group to be under assessment, but all must be properly equipped and be capable of undertaking the journey. Each Scout taking the test, will report independently. Have camped, as a Scout, for a total of 10 nights before completing his/her first class tests. One weekend camp, at least, must be included in the total. Demonstrate the proper method of dealing with the following emergencies: fire, drowning, ice-breaking and electric shock. Know the position of the main arteries and how to stop external bleeding from veins and arteries. Demonstrate how to deal with a fracture of the collar bone. Understand the importance of immobilising a fracture limb and the importance of not moving other suspected fractures. Demonstrate the use of the Triangular bandage as applied to the knee, head, and foot. Demonstrate how to deal with shock. Note: A Scout who has gained the First Aid Badge will be deemed to have passed this test. Swim 50 metres (50 yards) unassisted any style. If a Doctor certifies that bathing is dangerous to a person's health, the latter must, instead of this, pass one of the other badges: For Scouts under 15, Camper, Jobman, Woodcraftsman, Backwoodsman, Stalker or Starman.For Scouts over 15, Camp Warden, Handyman, Naturalist, Senior Pioneer, Tracker or Astronomer. The S.M. may allow a Scout to gain the First Class badge without passing the swimming test, provided he is satisfied that it is not practicable for the Scout to obtain facilities for learning to swim, and that the Scout gains the alternative badge as in the case of those holding a doctor's certificate. The Scout should make every effort to pass the swimming test as soon as possible. Read the meaning of a series of simple tracks made in sandy or other suitable ground. These should include running, limping, carry a weight, walking backwards, and blind gaits. Be able to recognise and name, from lists submitted by the Scout, 12 common trees and 6 common birds. Using improvised apparatus, such as a Scout staff, estimate three distances not more than half-a-mile (800m), and three heights not more than 30m (100 feet). In each case the estimate to be within ten per cent error above or below the actual. Demonstrate the following: sheerlashing, back and eyesplice, fireman's chair knot, manharness knot, rolling hitch. Use a felling axe for felling or trimming light timber, or, if this is impracticable, be able to log up a piece of timber and demonstrate the theory of felling a tree, and use a bush or cross-cut saw. Demonstrate the care and maintenance of an axe. Read and be able to use a 1:50,000 Ordnance Survey map (or its local equivalent). Use a compass. Point out a compass direction by day or night without the aid of a compass. Re-pass the Second Class badge tests 1-10 inclusive. This test will be taken next to last. Go on foot, with another Scout or up to two other Scouts, a 24 hour journey of at least 14 miles (22.5km). In the course of the journey the Scouts must cook their own meals, one of which must include meat, over a wood fire in the open; find their camp site and camp for the night. The Scouts must carry out any instructions given by the Assessor as to things to be observed en route and those under Assessment make a log of their journey sufficient to show they have carried out those instructions. The Scouts may do this journey partly by water and partly be land - at least 5 miles (8km) of the 14 to be done on foot. (a) Equipment. Clothing, footwear and equipment should be suitable for the activity and the environment in which it is to be used and generally conforms to current accepted practice. The equipment must be capable of resisting the worst weather for, in the event of a serious deterioration in conditions, safety may well depend on it being able to withstand the prevailing conditions. (b) Personal Emergency Equipment. The following equipment must be carried; Map(s), Compass, Watch, Torch, First Aid Kit, Whistle, Coins for the telephone, Notebook and pencil, Spare Pullover and a Waterproof Jacket or Coat. If the Journey is in Wild Country, the following additions must be carried; A Bivvy/Survival Bag, Matches, Emergency rations, Extra Warm Clothing, Spare bulb and batteries for the torch. The weight of personal gear carried by members of the group must not exceed one quarter of their body weight. (c) Training and Practice Journeys. Training in safety procedures, First Aid, navigation, campcraft, country code, observation and recording must take place in addition to the skills required by the method of journeying and the environment in which the venture is taking place. Prior to the qualifying venture, all participants are required to carry out practice journeys which may be accompanied by adults. These do not need to be of the same duration, or in the same area of the venture, but the conditions need to be similar. Practice Journeys should include one or more nights of camping. (d) Homebase. There must be a homebase, to which the Scouts can make telephone contact during the journey, and a journey Supervisor appointed, who must be in the vicinity of the journey, to ensure the safety of the Group. The Supervisor should make daily contact with the Group. (e) Numbers. A minimum of 2 Scouts and a maximum of 3 Scouts, must undertake the journey. It is not necessary for all the group to be under assessment, but all must be properly equipped and be capable of undertaking the journey. Each Scout taking the test, will report independently. (f) Planning. This should be a well thought out and carefully planned activity approved by the Scouter/ Officer. A Route Card for each day must be filled in, containing distances, timings, check points, and in wild country, alternative bad weather routes and escape routes for each leg (i.e. civilisation, or a road, or regular footpath). A copy of the Route Card, along with a tracing of the route, on good quality tracing paper, or marked on a photocopy of the map being used, this must be supplied to both the homebase and to the Journey Supervisor. The Route Card and Map Tracing will enable any rescue team to locate the group quickly if any emergency occurs. A leather thong, worn on the right shoulder. hold the First Class Badge, the Venturer badge and two of the following badges; Astronomer, Camp Warden, Forester, Hiker, Master Cook, Meteorologist, Naturalist, Senior Pioneer, Tracker. A Scout may not count both the Astronomer and Meteorologist badges to qualify for the Thong. make his/her own Thong (the leather and instructions are obtained from GHQ). Before being awarded the Seaman's Badge, which is worn on the right arm, a Scout must hold the First Class Badge, the Venturer badge and two of the following badges; Boatswain, Helmsman, Fisherman, Naturalist, Meteorologist, Astronomer, Master Canoeist, of which either the Boatswain or Helmsman is obligatory. Before being awarded the Airman's Badge, which is worn on the right arm, a Scout must hold the First Class Badge, the Venturer badge and two of the following badges; Air Mechanic, Air Navigator, Glider Pilot, Hiker, Master Cook, Meteorologist, Naturalist, Astronomer,of which either the Air Mechanic or Air Navigator is obligatory. Note 1. The Bushman's Thong, Seaman's badge and Airman's badge are alternatives, and only one may be worn. Note 2. The Seaman's and Airman's badges are not restricted to Marine and Aviation Scouts respectively. Note 3. On production of a Doctor's certificate to the effect that a Venturer badge tests would be dangerous to a Senior Scouts health or physically impossible, the holding of the Venturer badge will not be obligatory. The appropriate Commissioner, however must satisfy themselves that the Senior Scout shows the qualities which would enable them, but for his handicap, to pass the Venturer badge tests. The Senior Scout must instead pass a third badge from the selected badges list above. The Grand Scout has been graciously pleased to authorise the issue of a special certificate to Senior Scouts or Scouts over 15 years of age, who have gained the Grand Scout's Badge. 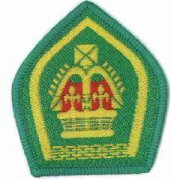 The badge is awarded to one who, having thoroughly trained themselves in Scoutcraft, places that training at the disposal of the community for public service. Hold the Bushman's Thong (or Seaman's or Airman's badge) and four of the Senior Scout public service badges of which Ambulance is obligatory. At any time after their 15th. birthday and after becoming a First Class Scout, have carried out approved service to the community. The proposed service should be approved by the Group Scout Master, who may consult any authority concerned. Service may be done within the Scout Movement (such as Senior Scout Instructor; working with Handicapped Scouts, etc.) or outside it (such as Sunday School Teacher; Hospital service; Emergency service, etc.). A certificate to the effect that this service has been carried out satisfactorily should be obtained by the Senior Scout from the Unit concerned, such as Vicar, Matron, Cub Master, etc., and countersigned by their Group Scout Master. The minimum duration of qualifying service is 24 working hours, either as regular service spread over 6 months or on a short-term project. In the opinion of t he Group Council be setting a personal example of the Scout way of life. Have had an interview with a GHQ Commissioner or other nominated person appointed for the purpose. A Senior Scout will receive their Certificate if they so desire at a reception provided at intervals by the Grand Scout. Hold the Bushman's Thong or Marine Scout Badge or Aviation Badge. Have shown the qualities of leadership and a desire to use these qualities, together with his/her Scout knowledge, to the benefit of a lower section. With the approval of the Senior Scout Master or Group Scout Master, have completed a probationary period of one month, and be prepared to continue, as an instructor to a lower section to the satisfaction of the Scouter/ Officer concerned. (a) Have a knowledge of, and ability to instruct in the subjects of the First and Second Stars tests and any two proficiency badges. (b) Show a reasonable knowledge of the Wolf Cub Manual. (c) Know the duties of the Cub Master and other Scouters/Officers and the difference between the Wolf Cub and Scout training methods. (a) have a knowledge of, and ability to instruct in the subjects of the Safe Beaver Badge, and the four Paw badges. (b) Show a reasonable knowledge of the Beaver Manual. (c) Know the duties of the Beaver Master and other Scouters/Officers and the difference between the Beaver and Scout training methods. Aircraft Constructor; Air Mechanic; Air Navigator; Air Observer; Ambulance; Archaeologist; Artist; Astronomer; Bible Knowledge; Boatswain; Bookman; Camp Warden; Cave Explorer; Civics *; Conservationist *; Despatch Rider *; Electrician; Farmer; Fireman *; Fisherman; Forester; Glider Pilot; Handicraft; Handyman *; Master Helmsman; Hiker; Horseman; Horticulturist; Interpreter *; Leading Piper; Leading Signaller *; Map Maker; Master Canoeist; Master Cook; Master Swimmer; Mechanic; Meteorologist; Mountaineer; Musician; Naturalist; Orator; Pathfinder *; Philatelist; Pilot *; Public Health *; Quartermaster; Radio Technician; Rescuer *; Rock Climber; Senior Athlete; Senior Bellringer; Senior Explorer; Senior Scout Circle; Senior Photographer; Senior Pioneer; Skier; Tracker; Venturer; World Friendship. Proficiency badges marked thus * are public service badges. Syllabi for all the above badges are available on request from GHQ. The First Class badge is worn on the left arm between the shoulder and elbow. The Ambulance badge is the only badge worn on both arms. It must be the uppermost proficiency badge, whenever gained. 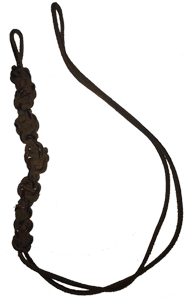 The Bushman's Thong is worn round the right shoulder and replaces the Scout Cord. The Seaman's Badge is worn in the centre of the right arm. The Airman's Badge is worn in the centre of the right arm. The Grand Scout's Crown is worn on the left arm above the First Class badge and surrounded by the qualifying public service badges. If any Ambulance Association's First Aid badge has been gained, this may be worn instead of the Ambulance Badge and is worn uppermost on the left shoulder. Swimming badges or Life Saving badges may be worn on the right sleeve just above the elbow. Only one badge may be worn, usually the highest award. The names given to patrols are those of previous Grand Scouts of The Brotherhood of British Scouts. Senior Scouts should research the Grand Scout that their Patrol is named after. Sir Francis Vane 1911..1912 (Vane Patrol) - Brown and Gold. Albert Jones Knighton 1913..1926 (Knighton Patrol) - Brown and White. Rt.Hon. Lord Alington 1926..1932 (Alington Patrol) - Dark Green and Red. Samuel Nalty Manning 1932..1967 (Manning Patrol) - Light Blue and White. Percy Herbert Pooley 1967..1971 (Pooley Patrol) - Red and Gold. Charles A. Brown 1971..1992 (Brown Patrol) - Red and Blue. Edward E. Scott 1993..2000 (Scott Patrol) - Dark Green and Light Blue. Rev'd. Michael J. Foster 2000..todate (Foster Patrol) - Light Blue and Gold. SPARE - Dark Blue and Gold. SPARE - Green and White. SPARE - Black and Gold. A Senior Scout Troop must form part of a BBS Scout Group, and the Scout Group must register the Senior Scout Troop under their Scout Group Registration, as for all Sections. The Scout Troop Scouters/Officers must apply for the appropriate warrant for their rank, the forms for which are available from the Group Scout Master or from the BBS Headquarters. Please note that a Scout Troop may be permitted to be formed in advance of a full Scout Group being established with the approval of the BBS Headquarters. The ranks for leaders follow similar to those in the other Sections of the Scout Group and are all warranted posts, in order of rank is the 'Senior Scout Master' (SSM) or 'Lady Senior Scout Master' (SSM), then the assistants referred to as 'Assistant Senior Scout Master' (ASSM) or 'Lady Assistant Senior Scout Master' (ASSM). The titles or names for the Senior Scout Scouters/Officers are traditionally taken from Naval Ranking. Therefore the name 'SKIP' must be used for the Senior Scout Master. Names for Assistant Senior Scout Masters and any adult helpers will be left to the discretion of the Section concerned, but the names that can be selected from are: 'BOSUN'; 'ENSIGN'; 'PURSER'; 'GUNNER'; 'STITCHY'; 'CHIPPY'; 'SPARKY'; 'MIDSHIPS' as typical examples. These names are also used in the Scout Section so if possible avoid the names already adopted in that Section apart from 'SKIP'. The training of Scout Troop Scouters/Officers follows the same course as for all other Sections, consisting of a 'Preliminary Training Course' (PTC) that will probably be carried out over a weekend, or two day sessions or maybe several evening sessions. At the end of the course a Certificate will be issued and a two-stranded Turk's Head Woggle will be presented. Safety in the Troop Meetings - Where there are boisterous games it is necessary to remove out of harm's way all things that are likely to cause injury, e.g. tables and chairs, ropes and other equipment not required for that game and especially sharp or pointed objects. Look out for things likely to lead to accidents. Safety on the Road - The 'Green Cross Code' is an essential part of our Scouting programme and all Scouts should be made well aware of this and be putting this into practice on all outdoor activities and expeditions. This is particularly important if a Patrol or Troop have a need to cross or walk along a road. Other applicable part of the Highway Code must also be learned and put into practice when appropriate, particularly the sections applicable to pedestrians and cyclist. First Aid - All Scout Troops should have to immediate hand a comprehensive First Aid Kit. This should contain the normal requirements items for dealing with cuts and scratches, grazes and bruises. In addition a small note book to record any details of injuries sustained and the treatment given and by whom, along with the name of the Scout, the date and time and finally the location. A current edition of the First Aid Manual issued by the British Red Cross or similar authority must be kept in the First Aid Kit. Any head injury which appears to have concussed the injured person should be dealt with at the nearest hospital. Wherever possible one of the Scouters/Officers in the Scout Troop should be trained in First Aid and preferably hold a valid STA 'Activity First Aid' and 'Emergency First Aid Ay Work' Certificate, or have attended a First Aid Course offered by the British Red Cross or similar authority to the same level. Senior Scout meetings should be arranged to suit the age group. Meeting lengths of time are flexible for this Section, but normally they will last approximately two hours, and of course as much as possible within the programme should be arranged for outdoor activities. It is advisable that a Senior Scout Council meeting should be held at regular intervals. This is an informal meeting of the Troop Scouters/Officers with any other adults working with the Section, to discuss programmes and activities. Membership subscriptions should be levied on the individual Scouts. This should be determined by the Group Scout Master in consultation with the Scout Master and should be a reasonable amount, bearing in mind local conditions and expenses incurred in running the Scout Troop as a part of the Scout Group. The monies must be properly accounted for and banked with the Scout Group Treasurer, and the monies expended at the discretion of the Group Scout Master in consultation with the Scout Master. A float could be issued for the Scout Master's accountable cash purchases for the Scout Troop. Both Boys and Girls are eligible to join this Section when they have attained the age of 15 years. They transfer to the Rover Scouts when they have achieved the age of 18 years or undertake a role as an assistant Scouter/Officer in one of the Sections within their Scout Group, or of course the can become both a Rover Scout and an Assistant Scouter/Officer, fully fulfilling both roles. BBS and BGS Arrow Badges - Two of these Association badges are worn, one on the right breast of the jersey and one on the right arm at the same height as the breast badge. Scout Group Nametape - The Scout Group nametape is worn at the top of the right arm shoulder of the jersey, following the shoulder seam around. Order Of World Scouts Badge - This badge is worn on the right breast of the jersey just below the BBS and BGS Arrow badge. This badge is the badge worn by all members of the international 'Order of World Scouts' (OWS), the international membership badge. The Scout Troop cannot exist in isolation as it is, nor should be, it must be a Section of a Scout Group (unless a new group just forming with Scouts only to start with). There must be contact and interactions with the Beavers, Wolf Cub Pack and the Senior Scout Troop on regular occasions to show a good Scouting example to the younger Sections, as well as knowing other Section Scouters/Officers and members of other Sections that they are members of a family in Scouting. Combined activities are very important and all Scouts should fully support these that may be organised by the Scout Group, such joint activities as parades; hikes; parent and members games; fetes and fund raising; Christmas parties, etc. Joint activities with young persons of comparable ages in other organisations such as the Guides and other associations' Scout Sections, Church youth groups, or competitions with school teams are to be encouraged. As our aim is the promotion of our Scouting and all it stands for, and to be seen taking a useful role in community activities and society, we must therefore participate in outside activities and fully support these activities; and not permit the membership to be lukewarm in their participation of these joint or share activities, thereby letting the Scout Group down. We are principally a Christian Scout Association as such Church Parades and attendance at one's own Church is an essential element for Scouting, embedded in its Scout Promise/Pledge and Scout Law. Therefore Scouts must be encouraged to fully participate in all the Scout Group Church Parades, particularly the St. George's Day Church Parade where the Scouts re-affirm their Scout Pledge/Promise and Scout Law. Monthly Church Parades are recommended in order to fulfil the important elements within the Scout Pledge/Promise and Scout Law with minimum attendance targets set for members. Scouts should take pride in supporting all Church Parades, the marching, the Hymn singing, the pride in being seen in uniform and carrying their Section flag, thereby reinforcing their part played in the family of Scouting. And of course other young people see them and want to join. The programme of activities should be appropriate to the 10.5 and 15 year olds and for both boys and girls, particularly in mixed meetings. As well as outdoor activities the programme should consist of, amongst other things, games with a purpose to promote character building and self-reliance, a sense of duty to others, fun, sportsmanship and interest in the outdoors. Sample programmes can be obtained from the BBS Headquarters on request. Note: Scout Troop Progress Charts (A3 Display Charts For Wall Hanging) Can Be Obtained From The BBS Headquarters On Request. We trust that this handbook will be found of great assistance, any questions or requests for further information, please contact the BBS Headquaters. Wishing You a Great Scouting Future.